Dreamwatch online has published a new and ‘exclusive’ interview with new series Survivors co-creator and lead scriptwriter Adrian Hodges (dated 4 April 2008). Although it has not been confirmed that the character of Abby Grant will feature in the new series, Hodges does say that he has ‘no intention’ of ending the series with the same denouement which concludes the original Nation novel – which depicts the tragic and bloody outcome of Abby’s long-sought-after reunion with her son. Hodges is keen that the new series will have a strong contemporary feel, with a range of characters reflecting the social composition of the UK in the 2008. 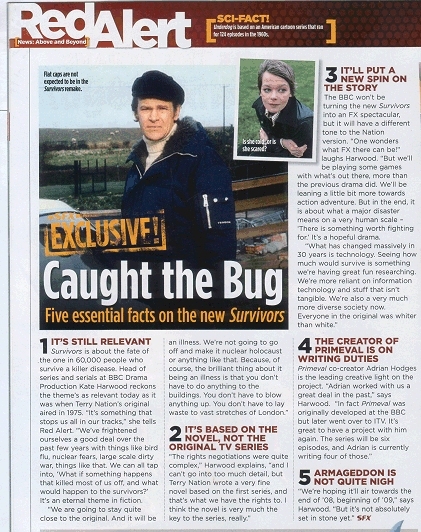 DeathRay contradict one key ‘fact’ revealed in a recent SFX interview with Head of Series and Serials Kate Harwood – insisting that the new series of Survivors will comprise 13 episodes (rather than six, as reported in SFX). 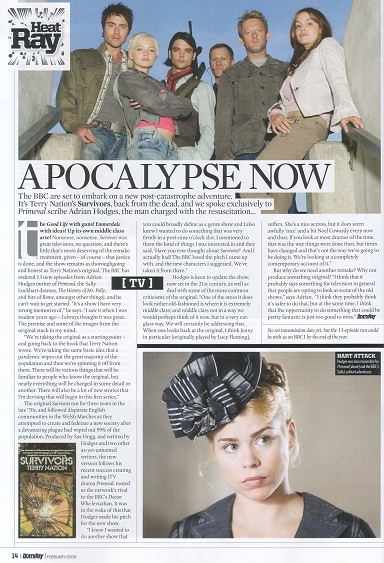 Note, 17 April 2008: To clear up a misunderstanding that has appeared on a number of other blogs, forums and discussion lists – the main photo in the DeathRay article is not of the new Survivors cast, but from the ITV dino-romp Primeval, a series that writer Adrian Hodges has been closely involved with since its inception. No cast photos from the new Survivors series have yet been released. The BBC is making a modern version of cult 1970s drama series Survivors, writes Liz Thomas. The BBC1 show will be set in the present day but will follow the post-apocalyptic premise of the original programme. BBC drama production has acquired the rights to develop Survivors from creator Terry Nation’s estate and has lined up Bafta-winning Adrian Hodges to pen the series. Terry Nation is credited as one of the creators of Doctor Who and architect of the Daleks. He also masterminded Blake’s 7and Survivors. The programme launched in April 1975 and ran for 38 episodes over three series. It followed a group of individuals trying to survive after a plague wiped out most of the world’s population. The executive producer for BBC drama production is Susan Hogg. The Forbidden Planet International blog reports on the BBC’s announcement that it will be remaking Survivors. The advertising and marketing database Brand Republic has picked up on the BBC’s Survivors remake announcement, basing a short news story of the BBC Press Release. The full text of the article is only available to Brand Republic subscribers. 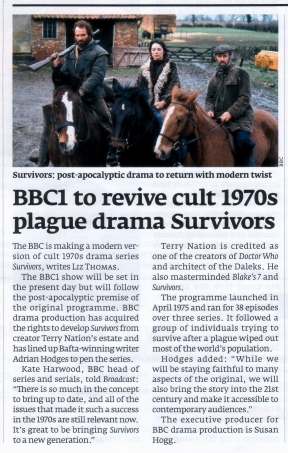 On 22 November 2007 the BBC News site confirmed that a new series of Survivors will soon enter production, following the successful conclusion of negotiations with the estate of Terry Nation for the rights. The new series will be made in-house by the BBC Drama Department, and will be executive produced by Sue Hogg. The series will be written by Adrian Hodges whose screen credits include Ruby In The Smoke, Shadow In The North, Charles II and Primeval. Hodges says: “Survivors was one of the bravest and most exciting programmes of its time and I’m thrilled to be involved with re-imagining it for a new audience… Its themes remain as relevant as ever and while we will be staying faithful to many aspects of the original, we will also be bringing the story into the 21st Century and making it accessible to contemporary audiences. Survivors will be broadcast on BBC1, although no transmission dates for the new series have yet been confirmed.